If you want to gain superpower of looking very cool on your Naruto-inspired cosplay, you can't choose better! Become a Naruto character with Sasuke contacts! 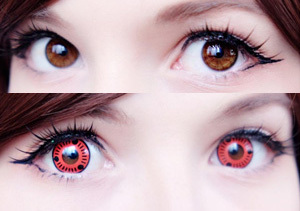 Costume contact lenses perfect for people who love anime, Naruto in particular. ColourVue Sasuke contact lenses are red and black colored contacts inspired by the most popular anime in history, Naruto, and its main character, Sasuke. They represent the third stage of the so called sharigan, which reflects special powers of the person that has it. If you want to feel like Naruto character and enjoy special power of looking cool among your friends during cosplays and costume parties, order now a pair of ColourVue Sasuke contact lenses!